Plan your garden the smart way with these free online planners. Using a free garden planner to plan the layout and contents of your garden is a great way to stay organized and get everything you want out of a garden. Each garden planner has various tools that will make it easy for you to come up with a plan of action. You'll be able to specify size, shape, and terrain, add boundaries such as fences or walls, plan a sprinkler system, place plants, trees, or bushes, and much more. Many of these programs let you zoom and move around to get all the features placed exactly where you want them. You can also start out with a garden design template or create your own plan from scratch. After you've planned your garden, many of the planners let you print out or save your garden layout, including a list of supplies you'll need to buy to implement your design. At the bottom of this page is a list of garden planners that are free only for a limited time. You might want to consider those if you need more out a planner but only for a short time, or maybe you want a trial version before committing to a professional edition. Here are some other resources for your gardening and outdoor activities, including ways you can get free seeds, free seed catalogs you can request by mail, and free plans to help you build a greenhouse or garden shed. This online garden planner lets you add many different objects to the scene along with your plants. You're able to edit the color, width, and length of every object you add to your plan. This comes in handy when you're not only planning on screen but also when you're building off screen. When ready to print your garden plan from SmallBluePrinter.com, you can choose to include the object list along with the design. This will print you off a list of every single item in your garden, complete with sizes, quantity, and a small image of the object. Also available when you print your design is a coded system that matches up with the item list. This means you can match up the listed items with the picture to know exactly where you're going to place each object. Note: You can build a garden and even print it off using this online planner, but you're unable to save your plans to an online account. This means you must not close out of the website or you could lose your progress. Smart Gardener is similar to other online garden planners but isn't as detailed with the landscape. Instead, you can build your planting beds, lay your desired plants into them, and then print off a very detailed list of everything you have in your garden. This is what I like most about Smart Gardener — that the printout is very detailed. This is important so you understand exactly what it is that you've placed in your online garden so that you can do the same in your real garden. There are square, rectangular, circular, and triangular planting beds available, all of which can be adjusted to a custom size. Adding plants is as simple as dragging them from the sidebar directly onto a planting bed. When you're finished and ready to print your garden plan, you get the whole image of the garden plus a list of all the plants, showing the seed depth, spacing, and plant height, each with a detailed illustration of the size requirement for the bed. Plan-A-Garden is easy to use because it supports drag and drop. Plus, all the objects you add to the garden are 3D to make it look more realistic than a simple bird's eye view like some of these planners support. To help you build your garden, the planner walks you through a wizard. First, just select a background scene from the pre-made templates, like the house you see here. Then, you can drag fences, benches, and arbors into the scene to customize the look. Finally, you get to brush a surface onto your garden, such as a lawn, brick path, stones, tiles, or gravel. Of course, you're able to include all sorts of plants to the garden. There are tons of trees, vines, shrubs, bulbs and more that are simple to add via drag and drop. Some of these objects can be filtered by type, size, and light to help find the ones you want. Your garden can be saved online so you never lose your progress. When completely finished, you're able to save the image of the garden you've made as well as export a list of the plants you've included in your garden. Something I don't much like about Better Homes and Gardens' Plan-A-Garden when compared to the other online garden planners from this list is that it's not as easy to add objects and plants to the garden. You only get one view to see the garden from, so moving objects around on the screen becomes a bit limited. Note: GardenPuzzle is another garden planner that's very similar to Plan-A-Garden. As you can see from the picture, the online garden planner at Gardeners.com is very simple. Just scroll through the different plants and drag and drop the ones you want onto the grid. The grid can be up to 5 by 12, and there are plenty of plants to choose from. Some of them include cucumbers, eggplants, carrots, garlic, cilantro, lavender, leaf lettuce, hot peppers, okra, celery, melons, and chives. Once you're satisfied with your garden, you can print off the image of the garden only or include the planting information as well. The planting information includes lots of useful information, such as how to plant the seeds, how much spacing is required, how often you should plant a new crop, the number of days until harvest, and even a hint to help you successfully sow the seeds. This online garden planner also has pre-made garden plans that you can use as inspiration. Vegetable Planner is extremely simple to use and functions just like the one from Gardeners.com. 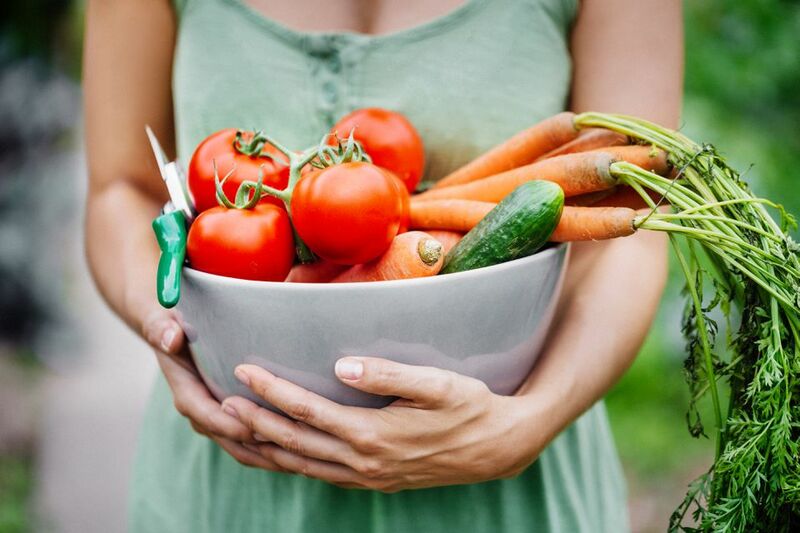 Just click the arrows to scroll through the different plants, where you can find garlic, lettuce, onions, peppers, spinach, pumpkins, potatoes, rosemary, tomatoes, turnips, and more. While this garden planner is very easy to use and may work great for what you're after so you don't have to draw out the plan yourself, there is one thing I found very limiting about it. Printing your garden plan off doesn't include anything but the image of the garden you've built. There is no useful planting information or measurements included like there are with the planner from Gardeners.com. This means there isn't much useful information from a printout except the image of the garden. Marshalls Garden Visualiser does just what you'd expect a free garden planner to do — it lets you visualize your garden in 3D space, much like a video game. While building your garden, you can move around in it as if you were actually there, which really helps you understand how it will look in real life. This online garden planner lets you specify exactly how large you want your garden to be, and you can even customize the shape of the ground to make it exactly how you plan on building it. Garden Visualiser asks you add a boundary to the garden, such as fences, walls, or hedges. When ready to design your garden, you can choose from various themes or build one of your own from scratch. You can even add a picture of your home so the garden can sit beside it to give you an idea of how it will look when you build it. Tons of products can be added to your garden with Marshalls Garden Visualiser. Some of these include paths, edgings, garden surfaces, summerhouses, walling, and paving. Your garden can be saved in your online account as you're working. When finished, you have the option to find an approved installer to help you build the garden, or you can request information from Marshalls to order all the required products to build it yourself. Note: This website requires the Unity Web Player to be installed. If you can't get the website to open in your browser, try a different one like Firefox or Internet Explorer. The online garden planners from above can be very useful for what they provide. They let you start building a garden in virtually no time and don't require a program download. However, ​a full-fledged desktop software may be more beneficial for your needs. They give you many more tools to work with and let you customize nearly every aspect of your garden. Following are a few additional garden planning applications. They are functional only for a set number of days and/or are limited in terms of features. Home Designer: This is a professional 3D designing program that supports building landscapes. You can add any plant you like because you get to customize the name for everything in your garden. Garden Planner: This is another online garden planner, but it has tons of plants you won't find at the websites listed above. You can even have it send you emails to remind you when to plant your crops. Realtime Landscaping Architect: There are only a handful of trees, annuals, shrubs, and perennials with the trial version of this program, but its extensive landscaping features make it ideal for designing the pathways, terrain, water features, and buildings that you may want surrounding your garden. Another program very similar to Realtime Landscaping Architect is Uvision 3D Landscape Creator. One difference I found is that there are more plants to choose from in its trial version. 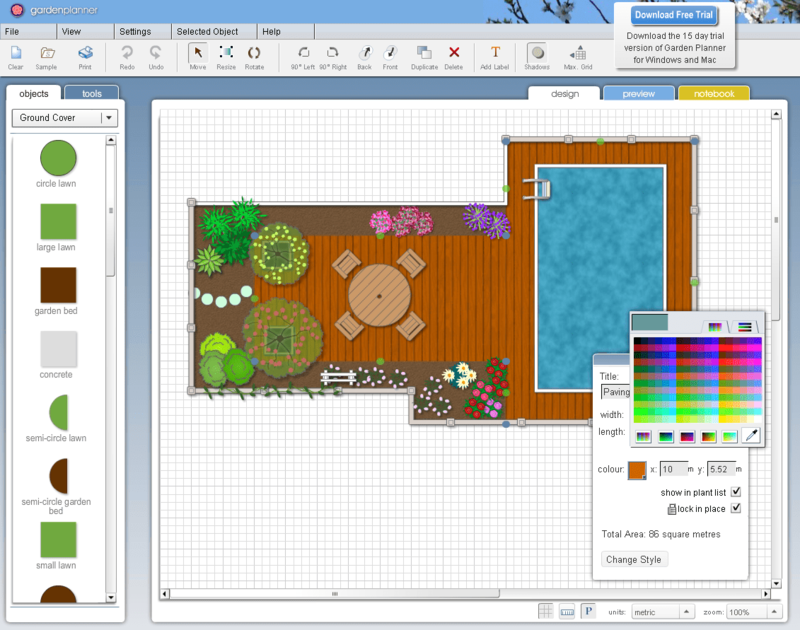 SmartDraw: Plan your garden online or with the desktop program, both of which are free for seven days. This planner is really easy to use because all of the objects are off to the side of the screen, and you have to just drag them into the canvas to position them how you want. SmartDraw is more than a simple garden planner because it includes objects for other designs, too, like floors, electrical diagrams, etc.